Today’s guest-post was written and translated by Danish freeform designer Troels Ken Pedersen. It previously appeared in Danish on the Plan B Rollespil. After a few awkward clashes on- and offline, I’ve had a flash of insight about how politics often hide legitimate differences in aesthetic preference, which can lead to avoidable frustration and bitterness. But first, to lay the groundwork, briefly. ”Aesthetics” is derived from the Greek word for sensation. The German philosopher Hegel hijacked the word to mean the philosophical study of the nature of art. There are arguments about whether roleplaying games (RPGs) can rise to the level of FINE art (I say hell yes), but RPGs are unquestionably an art form, or range of related art forms. Here, aesthetics means discussing what is artistically good, and AN aesthetic is a set of standards and values that state what is considered beautiful and thus good in a game. It is absolutely possible for something conventionally ugly to be aesthetically beautiful and therefore good in a game. For instance, a game that emulates the Sin City comics and films might consider conventionally pretty women as well as battered, grizzled men to be aesthetically good. Pretty men might be suspect–up to no good–in this context and would likely meet a sticky end. Grizzled guys might have a tendency to meet sticky ends too, but would do so with more dignity, because in this setting they are beautiful. In this setting, conventionally unattractive women DO NOT EXIST, and are thus a definite no go in this aesthetic, not merely ugly but unacceptable and excluded from view. Also, while aesthetics covers the question of what is beautiful in RPGs, people also have a really, really strong tendency to conflate beauty with moral goodness. Not merely in terms of general and conventional beauty norms, but in particular contexts, in terms of particular aesthetics. So: Aesthetics, standards for what is and isn’t desirable/beautiful within a given context, and discussion thereof. Right? Some time last year, after wading across a few blood-soaked battlefields in the war zone ”political correctness in roleplaying games,” something occurred to me: among both proponents and opponents of social-justice-y stuff in roleplaying games, you’ll find some people who find unfairness, abuse and the like fascinating in games, and others who think it should go away right now please. I found this interesting, and doodled a diagram. The interesting thing here is that while you might think that the most relevant divide is the ideological one, in terms of practical play, there’s a considerable difference in content preferences. It’s easy to go wrong if your point of departure is that you’re in ideological agreement. Agreement on ideology makes it simple to assume that others also share your aesthetic preferences for including or excluding bad stuff, and that is not necessarily the case. Being solidly on the pro-social-justice side of the ideological rift, this is naturally where I have the bulk of my experience, but I have observed the same pattern on the other side of the divide. I place myself pretty solidly in the top right corner. Not that I want all abuse, all the time, but I find playing with dark stuff interesting, and I like to use the dark stuff to push my worldview, to play around with the injustices that I’m interested in fighting outside roleplaying games. 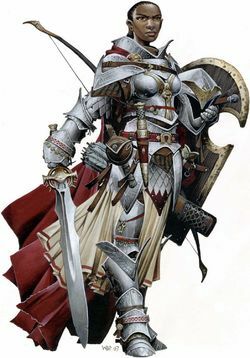 However, quite a lot of people with whom I agree politically prefer using roleplaying games as an escape, as wish-fulfillment, as a place where they can fight injustice and win here and now, or have a situation where being a woman, queer, or of color isn’t a problem at all. If they and I assume that we’ll make great playmates in a game because we agree politically, we can easily get burned. My preferences might have some connection to my status as a straight, white man who’s interested in oppression, but who is not personally as affected by oppression, but I know from experience that I have a lot of company in my quadrant who aren’t straight, white, middle class+ men. So us progressives are about morals, and the other side is aesthetics, right? No, it’s not necessarily that simple, and as is so often the case, beauty standards and moral standards get muddled. Bottom right players don’t just want to dictate morals, they want to not deal with stuff that they consider ugly and loathsome–that is an aesthetic point of view. On the other hand, top left players often justify themselves with words like “free speech” and “fighting the thought police” – clearly moral considerations. Bottom left players will be inclined to see themselves as clearly placing aesthetics ahead of morals and “politics,” but there’s a whole lot of politics hiding in their assumptions about what is and isn’t “political,” and these assumptions carry a lot of moral judgements. Most of all, there’s a couple of pitfalls to be aware of, in the form of ideological agreement veiling aesthetic disagreements that can lead to disappointment and unpleasantness in games. But it’s also worth noting a few places where games can hold real ideological disagreements under the same aesthetic hat. For instance, Dungeons & Dragons 5th edition, and Pathfinder with their Golarion setting, have done quite a bit of work on using including language and having a lot of iconic characters who aren’t dudely white dudes, while maintaining a let’s-go-dungeoneering feel with clear bottom left appeal. And quite nice she is. Sure, there are limits to Pathfinder‘s progressiveness – there’s a few misplaced underwear models in awkward poses (try doing an image search for “pathfinder sorcerer”), and there are some profoundly racially wonky things in the whole D&D setup with humanoid races that it’s by definition OK to murder, but a lot of work has been done to make the settings and books not scream ”eek! girls give you cooties!” (and similar things regarding sexuality and at least human race), and that’s not nothing. Here (and in D&D 5th), it’s not too hard for people from across the bottom of the diagram to play together, because some nice corporate people thought it would be a good idea to support that. In reality, I can imagine a number of games such as Vampire: The Masquerade and Apocalypse World where people from across the top part of the diagram can play together, and especially in the case of Vampire, often have. But of course, the risk of social conflicts and explosions is always greater when bad stuff explicitly IS on the table than when it isn’t. Legitimate differences of aesthetic preference is a thing, quite aside from ideological differences. This can be handy to keep in mind if you’re writing a roleplaying game, looking for a game or looking for players for a game. Troels Ken Pedersen is a veteran designer from the Fastaval tradition who came to freeform via tabletop and American indie games as well as Fastaval games. He’s recently been edging into more costumey larp, as you will see. Troels blogs (in Danish) about roleplaying over at planBrollespil. You can read other entries from his catalog in translation here. This entry was posted in Blog, Larp and tagged larp theory, social justice in gaming, Troels Ken Pedersen by Lizzie Stark. Bookmark the permalink. 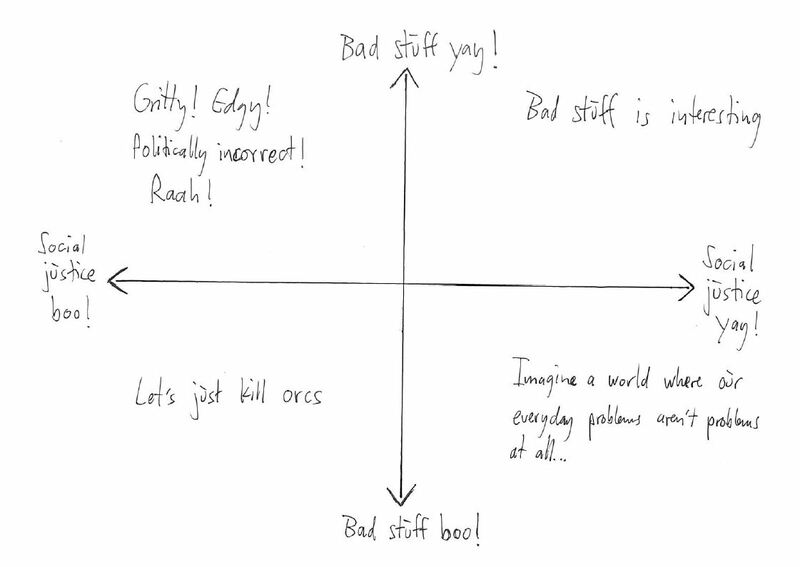 “Bad stuff” can be juicy story meat or it can be a reminder of lived frustrations, and particularly if you are playing your lived experience with people for whom that is “an interesting social justice issue/piece of juicy story meat”, friction can occur. Personally, I can see that I find games about sexism a lot more draining than games about class or race (plus, they require a lot more trust in my co-players and the game designer), because, well, I’m female, upper middle class and from an ethnic majority.